Meet Anthony. He’s the Warehouse Coordinator at our Raleigh Branch. Anthony helps unload food donations from our trucks, weighs them, and prepares them for distribution to our partner agencies. He is always the last one out of our distribution center, making sure everything is in order for our drivers so they can get on the road first thing in the morning. Anthony has worked at the Food Bank for over 12 years and is a veteran of the U.S. Army. He was stationed in Germany for three years, Fort Bragg, NC for four years, and Italy for two years. Once leaving active duty, he joined the U.S. Army Reserve Unit in Rocky Mount, NC and realized a long term goal by retiring with 27 years of service to his country. He graduated from Sanderson High School and always cheers them on in our annual Students Against Hunger food drive competition. He also enjoys promoting Food Bank events such as Heart of Carolina by wearing his event t-shirts around the warehouse and in the community. Thank you for your continued service, Anthony! We appreciate your hard work and big smile! 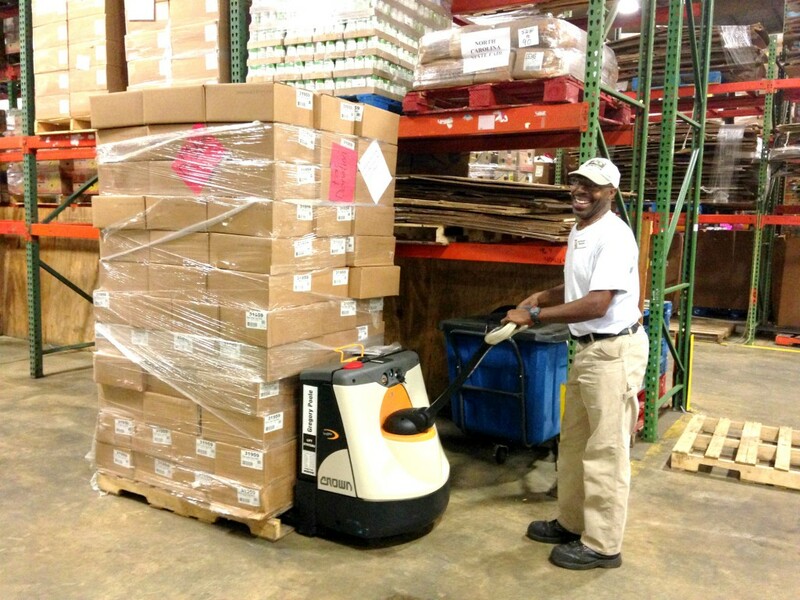 Anthony moves food off of a truck using a new pallet jack donated by Triangle United Way. Thank you, Triangle United Way, for donating this essential piece of equipment used in our daily operations!